Samsung's recent retooling of its Galaxy Tab 10.1 tablet wasn't enough to ward off Apple's legal challenges, as the iPad maker has now asked a German court to stop sales of the redesigned Tab 10.1N. Germany's Dusseldorf regional court will hold a hearing on Dec. 22 to review Apple's request, according to Dow Jones Newswires. Apple is looking to bar the German branch of Samsung from selling the new Galaxy Tab 10.1N anywhere in the European Union. For now, Apple's challenge has no effect on sales of the device, meaning Samsung will be able to sell its touchscreen tablet during the busy holiday shopping season. Earlier this month, Samsung made slight modifications to the Galaxy Tab 10.1, earning it the "10.1N" moniker. The changes were made in an attempt to avoid claims of design-related intellectual property infringement lodged by Apple against the original design. 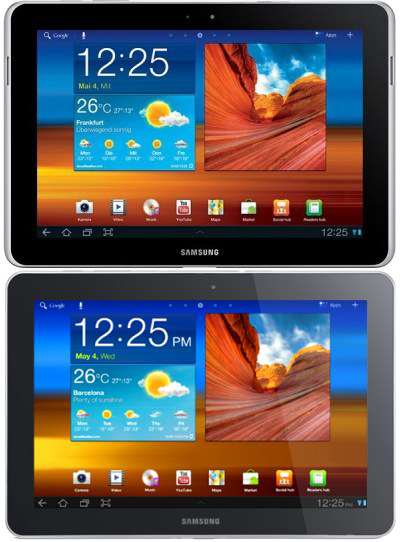 The redesigned Galaxy Tab 10.1N features a metal frame that wraps around its edges. Samsung was forced to make changes after a German district court upheld a permanent ban on the original Galaxy Tab 10.1 in September. The German court hasn't been the only one to deem that Samsung's tablet looks too much like Apple's iPad. Apple also won an injunction against the Galaxy Tab 10.1 in Australia in October. Germany's courts have been an important battleground between Samsung and Apple in their ongoing legal disputes. A number of complaints have been filed there, including one from earlier this month in which Samsung hopes to bar the sale of Apple's 3G-capable products: the iPhone and iPad.